Invasive plant species can quickly overtake and eliminate native plants in an area. 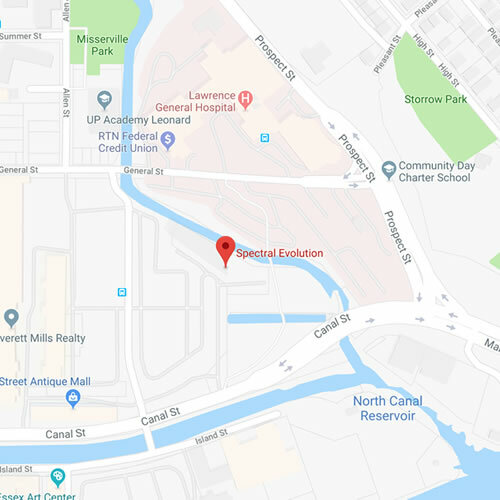 To battle and control these invasions, you first need to identify the invasive species, distinguish it even as an immature plant from native species, and map its distribution throughout an area. 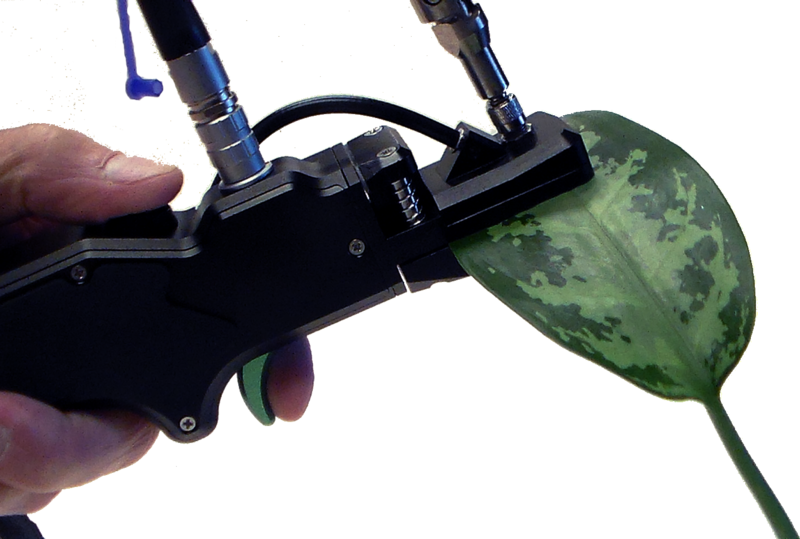 Equipped with our unique leaf clip, these instruments can be used for rapid field sampling. The spectroradiometers are fast and run off a lithium-ion battery. Two batteries are provided for about 6 hours of continuous scanning. The spectroradiometers are high resolution/high sensitivity instruments designed for field use. They are lightweight, rugged and reliable with no moving optical parts to break or misalign. The leaf clip has a separate light source that is kept away from your sample so there is no affect on the sample during scanning. 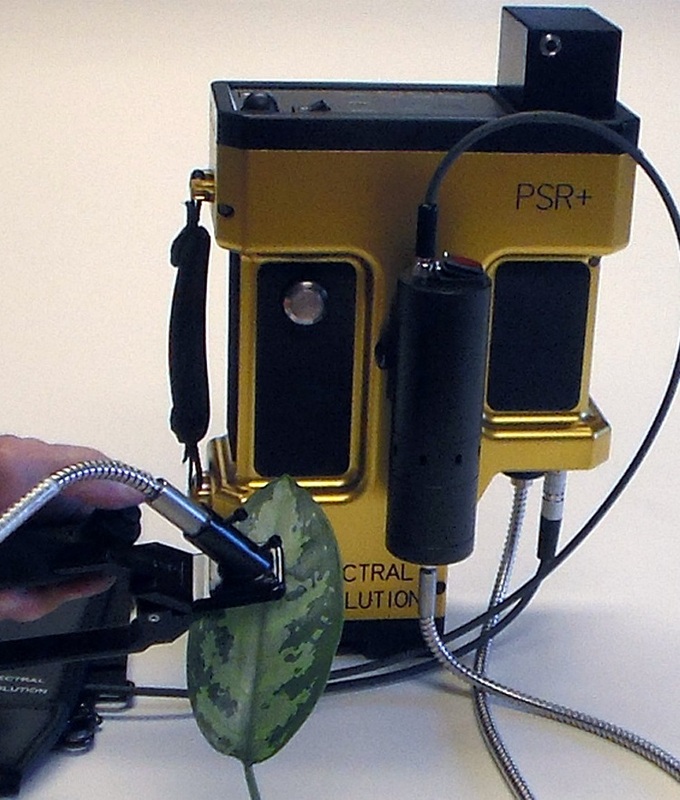 The light source, an ILM-105, is attached to the spectroradiometer using a rail system and keeps heat away from the leaf clip itself. The leaf clip has a built-in white reference and a swivel head. Just squeeze the handle and insert the sample into the clip. 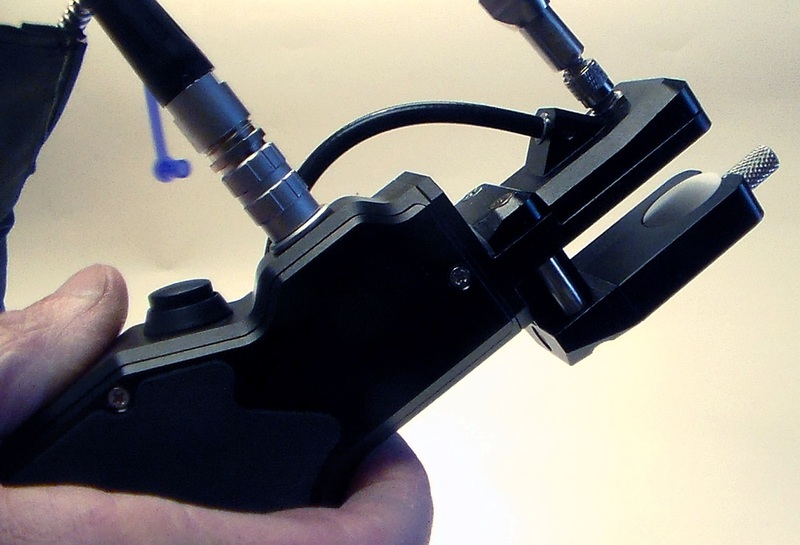 The PSR+ can also be used with direct attach lenses for standoff measurements. 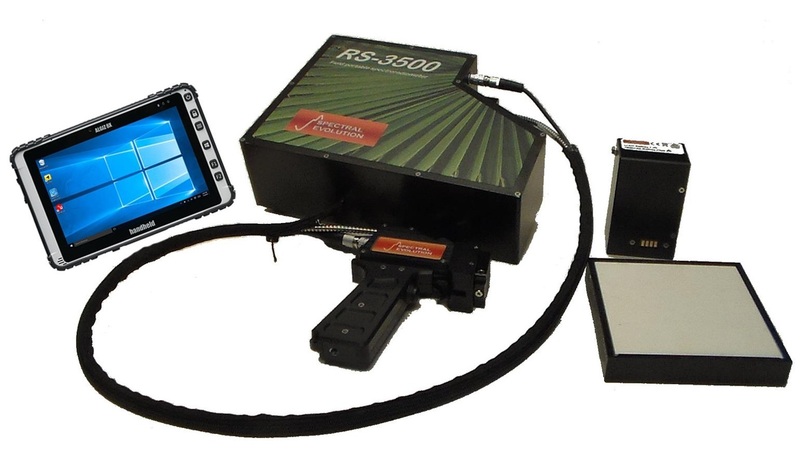 The PSR+ and RS-3500 can also be equipped with field-of-view (FOV) lenses and a pistol grip, a benchtop probe for crushed samples, soil, or powders, or a contact probe. Both spectroradiometers are available with EZ-ID sample identification software that allows you to build your own custom library. By identifying different invasive species at different stages in growth, you can compare samples to your library for fast identification and eradication. In addition you can check the health and monitor the growth of native species affected by the invasion. With the optional EZ-ID sample identification software, you can build your own library as you scan adding metadata such as plant name, species, operator, location, etc. As well as up to 8 custom metadata fields. All data is saved as an ASCII file for use with other analysis software. 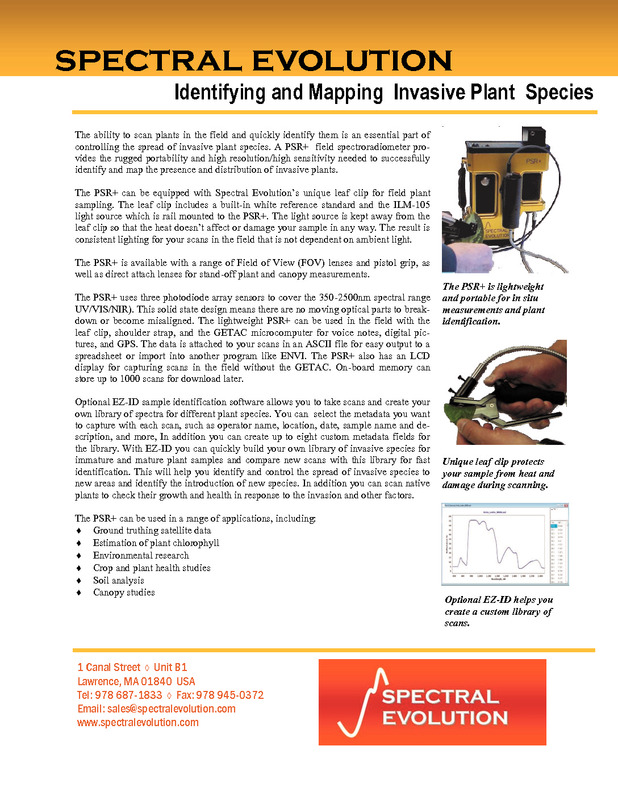 Designed for field use with solid state photodiode arrays and no moving optical parts, the PSR+ and RS-3500 spectroradiometers are ideal for in situ scans and fast species identification. Our unique leaf clip is well-suited for species identification. A white reference panel is built into the swivel head. After taking the reference scan just turn to the black side and insert the sample leaf. Scanning is quick easy and accurate. 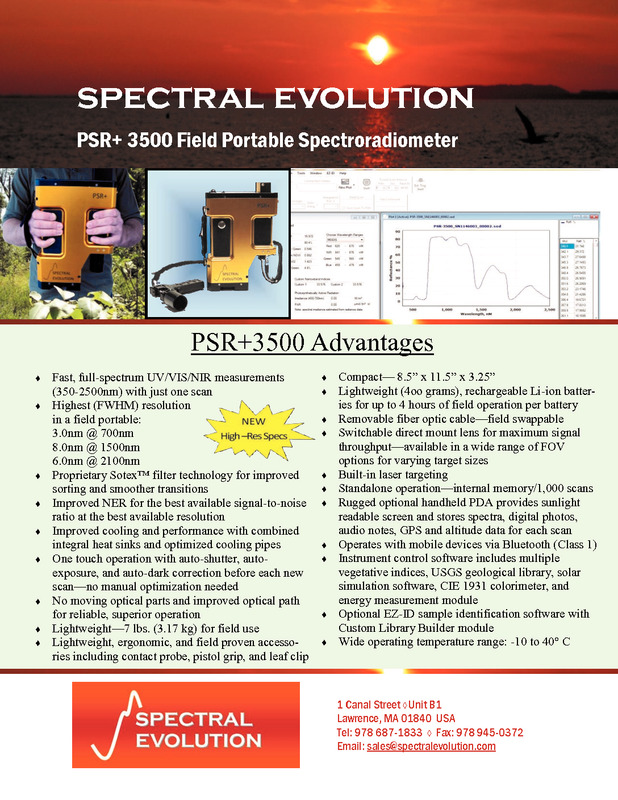 Discover the unique advantages the PSR+ can deliver that other spectroradiometers only promise. Download our flyer.